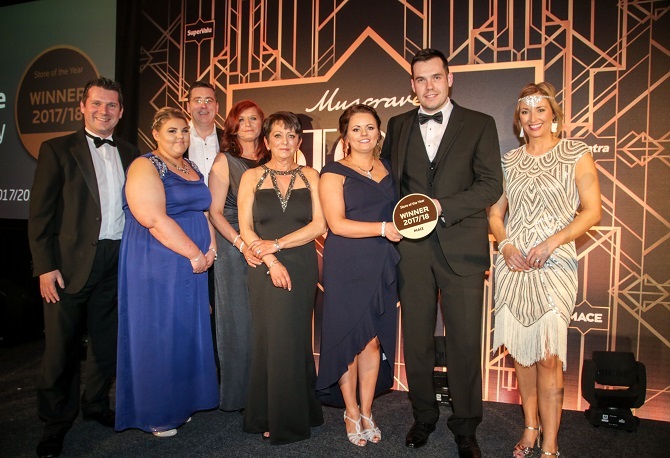 McCaughan’s MACE in Armoy clinched the coveted title of ‘Store of the Year’ at Musgrave’s annual awards event held at the Culloden Estate & Spa on 23rd March. The Armoy store was also named MACE Store of the Year over 1800 sqft while Boyd’s MACE Toomebridge was crowned MACE Store of the Year in the under 1800 sqft category. All the winners were greeted on stage by Managing Director of Musgrave, Michael McCormack and Sales Director for SuperValu and Centra, Nigel Maxwell. The evening, hosted by TV presenter Claire McCollum, also saw MACE Sion Mills announced as Newcomer of the Year and Campbell’s MACE, Ahoghill recognised as Fundraiser of the Year for NI Chest Heart and Stroke, MACE NI’s charity partner. Musgrave organises the awards ceremony each year to showcase and recognise its 240 independent retailers in Northern Ireland across the SuperValu, Centra and MACE brands and finalists are selected using a rigorous selection process involving several rounds of performance and standards audits. Finalists in the MACE Store of the Year under 1800 sqft category included Dolan’s MACE, Strathroy and Hoey’s MACE, Rosetta Road. Collingwood’s MACE, Aghalee and Spence’s MACE, Ballywalter were shortlisted for the MACE Store of the Year over 1800 sqft. Speaking at the event, Musgrave Managing Director, Michael McCormack, said: “Huge congratulations to all of our winners at this year’s Store of the Year Awards. It was a tough competition with many wonderful contenders and the judging process this year was as rigorous as ever.